Banned Songs: Così Fan Tutte, music videos in 4 chapters, fundamentally subverts the idea of sound in video, being made to promote songs that don't actually exist. Its figures and scenes are appropriated from Mozart’s eponymous opera Così Fan Tutte. Selected scenes from the original opera are rendered into another time and space, where the mute protagonists sing their duets and solos relplaced with banned songs of the future. The genre of opera had developed itself as Gesamtkunstwerk, a total work, later to function as one of the forms of entertainment for people, up until the invention of film. 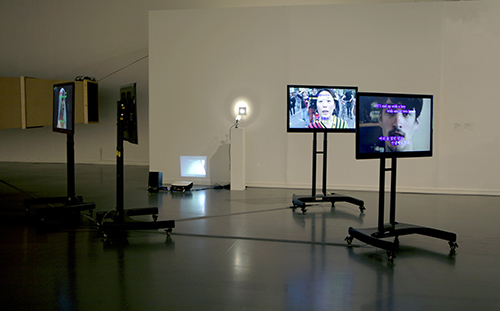 Kim superimposes it to the music videos on YouTube, where its consumption is extended in a vastly horizontal way. The basic element of sound is discarded, while the lyrics are suggested by the running karaoke subtitles. It reflects the linguistic moment in YouTube users' autonomously added multilingual subtitles as well as in the conventionally repeated mixture of English in non-roman pop lyric writing. 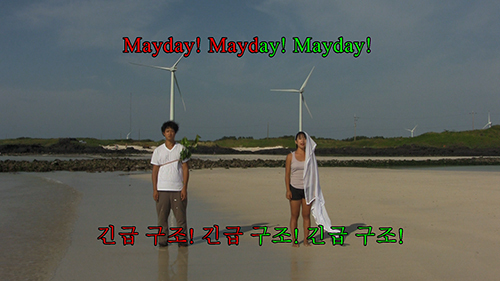 The editing of the motives and events give a sense of rhythm, reminding that of conventional music video. Yet each element that indicates a style or genre gets immediately subverted, it completely failing to pursue the typical effects of the genre. The text occupies the surface equally present as the image, reflecting on current issues in the society read from an imagined perspective of future. As a silent study on lyrics, rhymes and rhythm, it invites the viewer to the moments of inner- singing along to a song without sound. The first chapter I will take the chestnut-haired imagines a generation born in Fukushima after the neuclear accident and their dating habit in a new ecosystem, adapted from the opera scene where the sisters insist to amuse themselves with different partners. The second chapter In men, in soldiers deals with the issues of data surveillance and quantum computing, sung by Despina, the most pragmatic figure from the opera: she rebells against the control while projecting the current issues of data technology to the future. In the third chapter appears Don Alfonso, the oldest figure who observes and manipulates the young couples to challenge their truth. In Banned Songs he is a man from the future who gets lost in Euljiro, a district in Seoul where lo-tech industry in decline still survived next to a gentrified area mostly owned by dominant conglomerates. 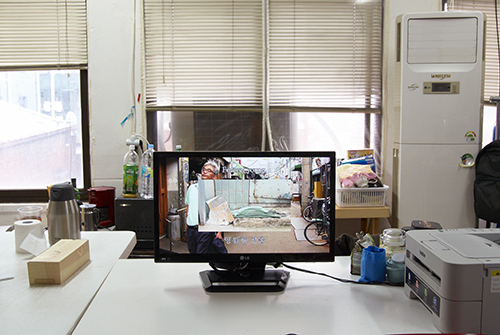 The chapter is presented at Guts and Cooperation, a group show at designer duo Eunjoo Hong and Hyungjae Kim's studio in Euljiro running parallel till October 19, 2013. The fourth chapter is Unkind one, why do you run away? with Fiordiligi and Ferrando, the swapped fiancées. It depicts the psychology of a political activist couple, whose relationship gets questioned under the daily struggle to save Jeju Island against the construction of a US army base. 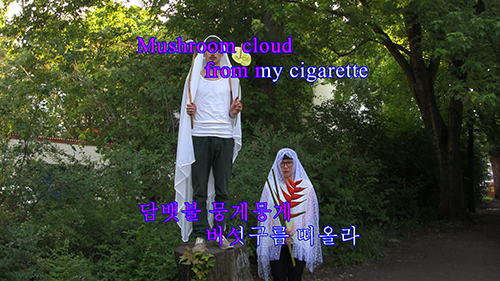 Each chapter is shot on various locations such as flower shops and sites of protest in Berlin, hardware market streets in Euljiro and country towns on Jeju Island in trouble, where current political and cultural issues and the involved people are reconstructed through another parallel perspective, that of an imagined future. The chapters are loosely connected to each other, through a common aesthetic of karaoke subtitles, as well as some repeating visual elements and figures. The scenes and figures are based on the original opera, yet rather than directly referring to it, Banned Songs analyses how the sentiments and values from the last centuries are manifested in the present, to be projected to the next ones. #4: Fiordiligi & Ferrando (fidanzati scambiati) - Barbara! Perché fuggi? Fiordiligi & Ferrando (Swaping Fiancées) - Unkind one, why do you run away? <금지곡들: 여자란 다 그래>, 2013. HD, 색, 무음, 총 4장, 각 약 3분, 가변 크기. <금지곡들: 여자란 다 그래>는 존재한 적 없는 노래들을 위한 4채널 무성 뮤직비디오 설치작으로, 영상에서 음향의 문제에 근원적으로 도전한다. 등장인물과 장면은 모차르 트의 동명 오페라 <코지 판 투테>에서 빌려온 것이다. 원작의 특정 장면들은 다양한 시공간으로 재해석되며, 등장인물들은 미래의 금지곡으로 치환된 각 장을 소리 없이 부른다. 종합예술로의 발전을 거쳐 근대 직전 영화가 발명되기까지 대중오락 장르로 기능한 오페라에, 현재 유튜브를 통해 그 소비가 무한히 확장되는 문화 상품으로서의 뮤직비디오를 중첩시킨 작업이다. 뮤직비디오의 기본 형식에서 소리를 제거하는 한편, 가사는 노래방 자막으로 드러난다. 이때 자막은 유튜브 사용자가 자율적으로 뮤직비디오를 각국 언어로 번역해 유통시키는 현상, 국적을 불문하고 관용구처럼 등장하는 영어 후렴 등 언어적 양상을 차용한다. 조금씩 엇나가거나 실패한, 뮤직비디오 장르 특유의 장면과 연기 연출, 편집 등에서 화면의 리듬이 발생한다. 가사는 영상과 동등하게 화면을 점유 하며, 동시대의 여러 문제 상황을 미래 시점에서 돌아본다. 관람자는 노래 자막을 따라 읽기 시작하는 순간 오롯이 내면적인 독창에 돌입하게 된다. 제1장 <난 저 밤색 머리 남자가 좋아> I will take the chestnut-haired는 원작의 자매가 서로 다른 배우자를 고르며 즐거워하는 장면을 각색한다. 후쿠시마 원전 폭발 사고 후 태어난 세대를 상정하고 이후 도래할 또 다른 생태계와 짝짓기 문화를 상상한다. 제2장 <남자를, 군인을> In men, in soldiers은 <코지 판 투테>에서 가장 현실적 인물인 데스피나가 등장한다. 개인정보 감시, 퀀텀 컴퓨팅 등 현재 회자되며 미래로 투영되는 정보 기술 발달의 문제를 다루고, 그 이면에서 작동하는 지배 논리에 저항한다. 제3장 <다들 그녀 탓을 하지> Everyone blames her는 10월 19일까지 을지로3가 홍은주 김형재 스튜디오에서 열리는 단체전 «근성과 협동»과 연계해 선보인다. 젊은 커플들을 교란시키며 관망하는 철학자 돈 알폰소가 변화 선상에 놓인 을지로의 복합적인 환경에 등장한다. 재개발, 거대자본의 유입과 공존하는 과거 풍경 사이에서 길을 잃은 미래인을 다룬다. 약혼자를 맞바꾼 피오르딜리지와 페란도의 듀엣 제4장 <무정한 사람아! 왜 도망 치나요?> Unkind one, why do you run away?는 제주의 자연과 강정마을 해군기지를 배경으로 한다. 정치활동가 연인이 불안정한 삶에도 불구하고 동반자 관계를 이어가려는 심리적 순간을 그린다. 각 장은 베를린의 꽃집과 시위현장, 을지로 공구상가와 청계천 그리고 제주 강정 등 각기 다른 장소와 시점에서 현존하는 사건 및 이와 결부된 인간 군상을 재구성하고, 그 정치적이고 문화적인 의미를 역사의 또 다른 시점에서 바라보기를 제안한다. 노래방 자막의 미학적 효과나 반복 등장하는 소품 등이 각 장에 느슨한 연관성을 부여한다. 장면과 인물은 오페라 원작에 기반하지만 그 자체를 참조하기보다 전시대에 그려진 희로애락과 가치관이 현재를 거쳐 다음 세대에 발현되는 양상을 그린다. 페란도 & 피오르딜리지 (맞바꾼 약혼자들) - 무정한 사람아! 왜 도망치나요?